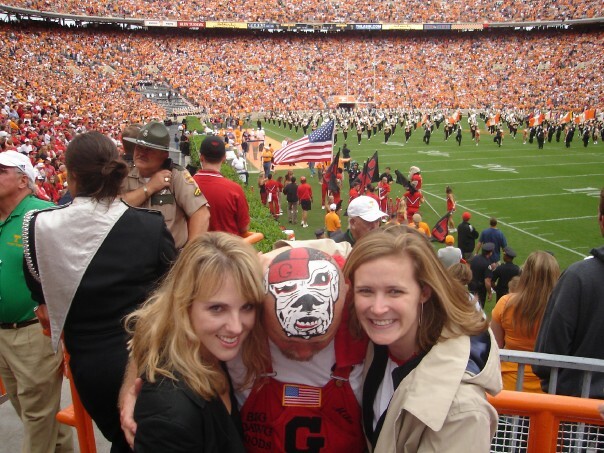 (Christy and I right before we watched UGA kill Tennessee- never been to tuscaloosa, best I can do right now). To the point where I won’t have a voice left. Yes, that is correct, I’m heading to Georgia-Alabama game. I’ll be in birmingham tonight, and Tuscaloosa tomorrow. YAY! Who’s excited! I am! GOOOOOOOOO DAAAAAAAWWWWGGGSSS! SIC UM! WOOF WOOF WOOF WOOF. Hit the cell up if you are going to be in these locations this weekend. P.S. Today is my cute sweet friend PAIGE TUCKER’s birthday! Give her a call. She will be reporting live from Tuscaloosa all weekend.